Many factors can influence the efficiency of pollinating insects; different weather preferences, the timing within the day or season, and pollinator life history and traits. Weather – Honeybees are less active in rainy or overcast conditions, whereas some native pollinators, such as bumble bees, do not mind these conditions as much. Additionally, the heat of the mid-day sun may limit the duration of time that certain species can be actively foraging. Pollinator life history – Different species will pollinate flowers in different ways. Insects come in many shapes and sizes, and this influences their ability to transfer pollen within and between flowers. Small bodied native bees may circle around the outside of the female part of the flower while honey bees more often pollinate the central regions of the flower. Complementary pollination through differences in size and behavior. Crop variety – Some insect species are not present the entire length of the growing season. This means that the pollinators that are active at the start of the season may not be the same as those that are present by the end. Strawberry growers in often grow multiple crop varieties at a single farm. 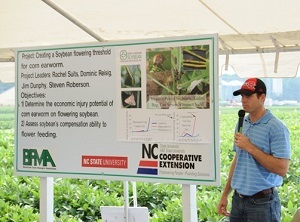 North Carolina “you-pick” operations typically favor “Sweet Charlie” (early season fruiting), “Chandler” (early-to-mid season), and “Camarosa” (mid-season) varieties. Greater insect species diversity allows for pollination of all varieties, even though flowers may be in bloom at different times and certain pollinators may only be active for a portion of the season. 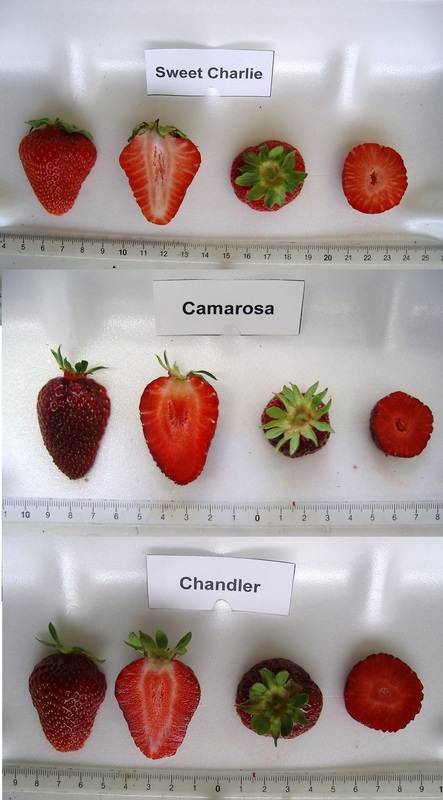 Some research suggests that different varieties may also be differentially attractive to pollinators and that pollinators may impact fruit size and quality differently among varieties. This means that greater species diversity may also allow for more complete pollination across all varieties. This also means that with additional research, an assessment of the local pollinator community could aid in variety selection. Pesticide intensity – Chemical pest management includes both preventative and remedial controls which may vary in use between years. Conventional growers may make around 15-20 synthetic pesticide applications annually to control pathogens, insects, and weeds. Conversely, organic growers, who have fewer chemical options, may make less than 10 applications per growing season. Although there are differences in chemical options and spray frequencies, management intensity at both conventional and organic farms occurs in practice along a gradient. Some conventional farms may spray pesticides more frequently than others, and the same holds true for organic farms. Higher pesticide intensity has been shown to reduce species diversity and abundance, thereby reducing pollination services. Although insecticides may reduce damage caused by pests, they may also harm predators and pollinators. Herbicides, which may kill weeds in the field, may also reduce local floral diversity and limit the food resources available to those same predators and pollinators. There is some evidence that fungicidal applications may also have an impact on pollinator performance. Landscape diversity – Landscape may also influence populations of beneficial insects. 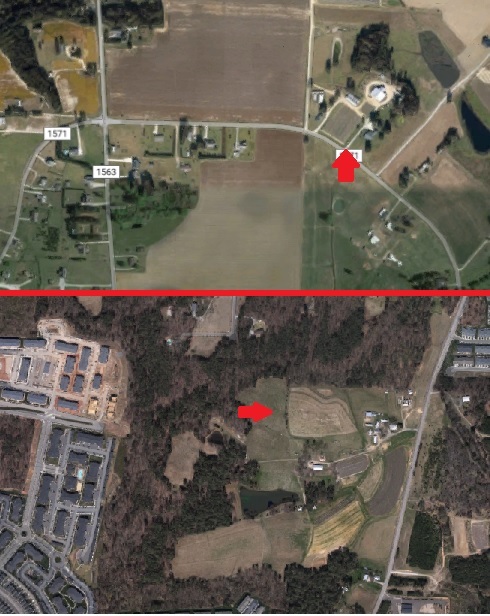 Some farms have urban surroundings while others may be nested within an agriculturally intensive area (see below). Insect communities, including pollinators, are dependent on the availability of flowering plants and suitable habitat for nesting sites. Farms are located in regions with a gradient of rural, agricultural (top) and urban, residential (bottom) surroundings. Farms with greater floral diversity tend to support pollinator abundance and reproduction by providing more food resources. In fact, a recent study showed that simplified landscapes (more agriculturally intensive) resulted in smaller native ground-nesting bees, meaning that less pollen could be transported per bee. Lack of resources resulting in a smaller body size also has implications for the success of future generations. In addition to supporting pollinators, greater floral abundance and diversity may also support greater populations of predatory insects. Planting flowers in and around a farm may provide food for beneficial insects, but many wild bees can also benefit from the introduction or protection of nesting sites and materials. As many wild bees nest in the soil or in wood, providing open soil, free from cultivation or planting, can provide habitat for aggregations of pollinator communities. Other practices include the introduction of “bee motels” constructed from bricks, bamboo, and other wooden materials which can serve as nesting sites for cavity nesting wild bees. Managed honey bees – The social nature of honey bees, in addition to their large foraging force and the production of honey, has led to their utilization as a key component of agriculture. The introduction of managed honey bee hives is necessary for the production of some crops, but the benefit of managed honey bees varies. For example, greater abundances of honey bees do not result in increased seed set in apples. Rented bees are taken across the country to visit many different crops in sequence of bloom. By renting or actively managing hives, farmers can take advantage of pollination services when crops are in bloom. When it comes to cost, farmers must balance having a sufficient number of hives for maximum pollination with the reduction of rental costs to only what is necessary. The cost of hive rentals has risen recently as beekeepers are faced with declining bee populations. This is often attributed to honey bee populations being challenged by a variety of parasites, pathogens, and stressors. Transporting bees over large distances increases the likelihood that these pathogens or diseases can then spread among colonies of managed bees, but also into the wild pollinator communities present at the farms renting the honey bees. Honey bee stocking density on a given farm may also be an important factor influencing managed and wild bee health. If managed honey bee workers are sick, this could result in the increased risk of spread of pathogens to wild bees. Conversely, honey and bumble bees may have some potential value in Botrytis (gray mold) control. Using insects to transfer control agents directly to flowers was shown to be more effective at reducing spores than fungicide spray applications. These effects from entomo-vectored (insect mediated) control agents were better than conventional fungicide regimes when disease pressure low and just as good under high disease pressure. Andersson, G. K. S., Rundlöf, M., & Smith, H. G. (2012). Organic farming improves pollination success in strawberries. PLoS One, 7(2). Benjamin, F. E., Reilly, J. R., & Winfree, R. (2014). Pollinator body size mediates the scale at which land use drives crop pollination services. Journal of Applied Ecology, 51(2), 440–449. Blaauw, B. R., & Isaacs, R. (2014). Flower plantings increase wild bee abundance and the pollination services provided to a pollination-dependent crop. Journal of Applied Ecology, 51(4), 890–898. Blaauw, B. R., & Isaacs, R. (2014). Larger patches of diverse floral resources increase insect pollinator density, diversity, and their pollination of native wildflowers. Basic and Applied Ecology, 15(8), 701–711. Blitzer, E. J., Gibbs, J., Park, M. G., & Danforth, B. N. (2016). Pollination services for apple are dependent on diverse wild bee communities. Agriculture, Ecosystems & Environment, 221, 1–7. Chagnon, M., Gingras, J., & De Oliveira, D. (1993). Complementary aspects of strawberry pollination by honey and indigenous bees (Hymenoptera). Journal of Economic Entomology, 86(2), 416–420. Connelly, H., Poveda, K., & Loeb, G. (2015). Landscape simplification decreases wild bee pollination services to strawberry. Agriculture, Ecosystems & Environment, 211, 51–56. Fürst, M. a., McMahon, D. P., Osborne, J. L., Paxton, R. J., & Brown, M. J. F. (2014). Disease associations between honeybees and bumblebees as a threat to wild pollinators. Nature, 506(7488), 364–366. Hokkanen, H. M. T., Menzler-Hokkanen, I., & Lahdenpera, M.-L. (2015). Managing bees for delivering biological control agents and improved pollination in berry and fruit cultivation. Sustainable Agriculture Research, 4(3), 89–102. Klatt, B. K., Holzschuh, A., Westphal, C., Clough, Y., Smit, I., Pawelzik, E., & Tscharntke, T. (2014). Bee pollination improves crop quality, shelf life and commercial value. R. Soc. B, 281. Linsley, E. G. (1958). The Ecology of Solitary Bees. Hilgardia, 27(19), 543–599. Park, M., et al. (2012). Wild Pollinators of Eastern Apple Orchards and How to Conserve Them. Cornell University, Penn State University, and The Xerces Society. Pettis, J. S., Lichtenberg, E. M., Andree, M., Stitzinger, J., Rose, R., vanEngelsdorp, D. (2013). Crop pollination exposes honey bees to pesticides which alters their susceptibility to the gut pathogen Nosema ceranae. PloS one, 8(7): e70182. Potts, S. G., Biesmeijer, J. C., Kremen, C., Neumann, P., Schweiger, O., & Kunin, W. E. (2010). Global pollinator declines: trends, impacts and drivers. Trends in Ecology and Evolution, 25(6), 345–353. Renauld, M., Hutchinson, A., Loeb, G., Poveda, K., & Connelly, H. (2016). Landscape simplification constrains adult size in a native ground-nesting bee. PLoS One, 11(3). Sumner, D., & Boriss, H. (2006). Bee-conomics and the leap in pollination fees. Agricultural and Resource Economics Update, 9(April), 9–11. Zebrowska, J. (1998). Influence of pollination modes on yield components in strawberry (Fragaria x ananassa Duch.). Plant Breeding, 117(3), 255–260.